When it comes to comfort food, I’ve always been much more of a pizza person rather than nachos and tacos. I always thought nachos were salty, greasy, and not “bread-y” enough (because your girl loved some bread). I never really ate them or had them around too much. That is, until I met my husband, Daniel. Daniel was born and raised in Rockwall, TX and does basically all of the Texas things that I wasn’t too keen on at first. He say’s “y’all” without hesitation, he’s fine with his ignorance in what a good bagel is, and his go-to food is nachos. Never have bought so many nacho ingredients in my life until I married him. There is tons of grass-fed cheese, non-GMO corn chips, and various nacho fixins in our kitchen at any given time. So I got curious. I wanted to experiment, but most of the ingredients were already out for me. 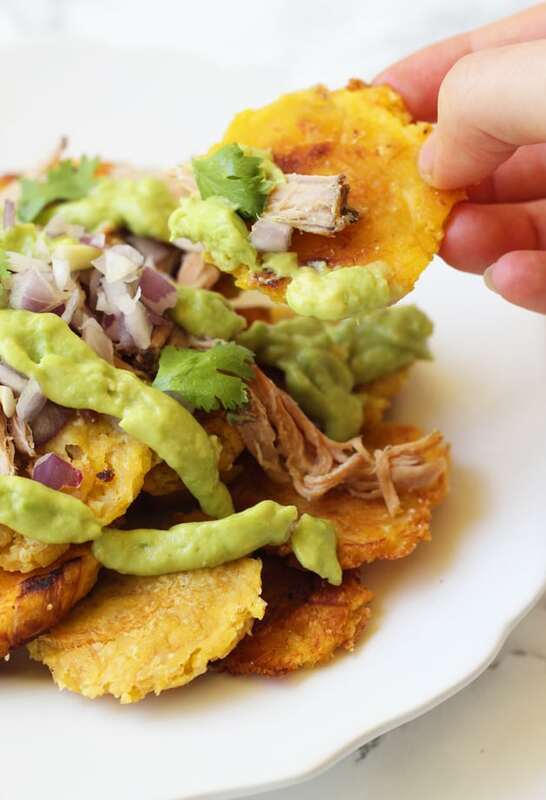 I had to get creative, so I went from these Plantain Carnitas Nachos! No chips, no problem. Even though I get my husband the non-GMO corn tortillas fried in coconut oil, I still can’t have those. Corn is a big time “no” for me, and I’m not willing to really splurge on something that makes me feel so bad. 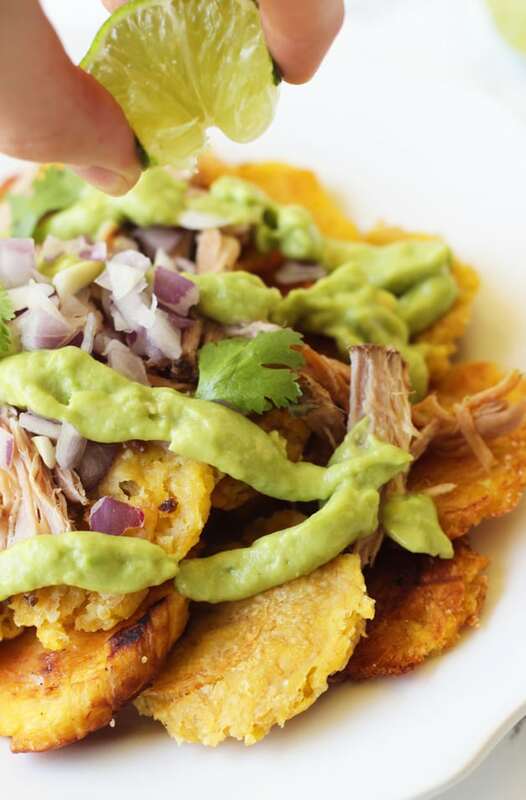 They’re made with green plantains, or tostones, rather than chips! I spent my life so caught up in grains that I never had plantains. Clearly, I was missing out! Plantains are essentially a starchy fruit, that can be used similarly to a potato when they’re green, or used as a sweet treat when they ripen. They’re used often in Latin American cooking and are a safer starch for those who are avoiding grains. Tostones, or fried green plantains, are sooo good. Everyone can appreciate them, and they’re the perfect crispy chip substitute for this nacho dish. They’re paleo, Whole 30, and AIP friendly! That’s a tall order… especially with something that’s traditionally full of grains, cheese, and nightshades. But they are! They’re nightshade free, so that mean they’re not spicy. 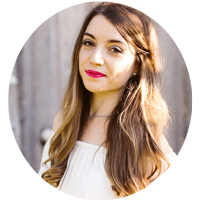 Those of us who are AIP and have an autoimmune disease know that I know I have a fair amount of Paleo-ish/ Whole 30 folks who read my blog that still eat nightshades. If you can tolerate nightshades, go for it. Throw on the spices, tomatoes and jalapeños and go to town. 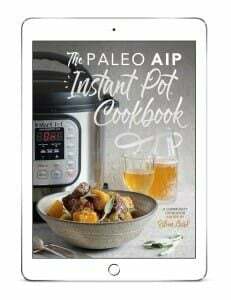 But rest assured that if you are AIP and nightshade free, the recipe is AIP as is. They may not be traditional nachos that you can get at a restaurant, but you guys… everyone will love them. Even the non-real food lovers can still appreciate these crispy, creamy, salty, savory nachos! When I make them, I split them up to just have a full meal between my husband and I, as they serve about two for a full meal. 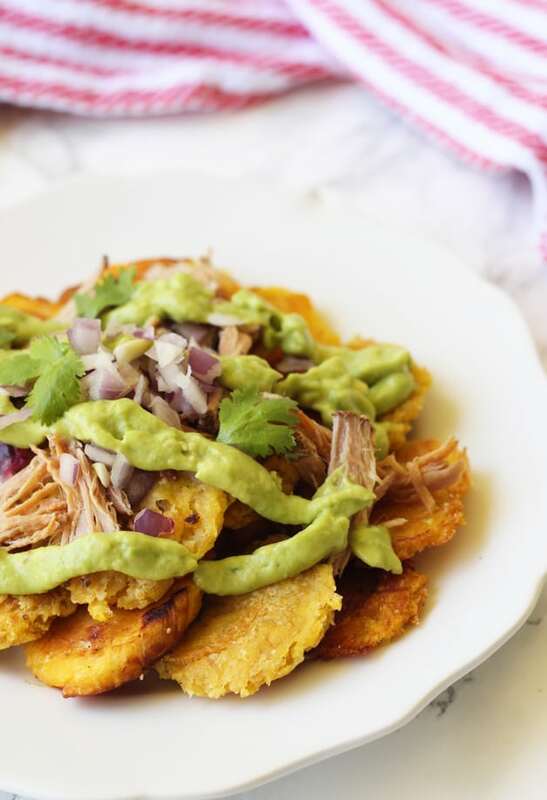 But, you can also portion them out into single tostones topped with the fixin’s and serve them one by one as a party appetizer or snack at a game day event. Like I said… everyone will love them. Hi Michelle, This recipe and others you have posted sound great to me! I’m happy to find your site. I am on a low oxalate diet to avoid kidney stones, several of your recipes fit the protocol. Have you thought of adding this? There is very little out there for us and we could really use the help.